Lets try to wrap it up a bit. Of course you want to compare this card with Lesser Diamond Spellstone or even more accurately with Diamond Spellstone. You got same effect for 2 more mana. On the other hand you dont need to cast 4 spell to upgrade spellstone. 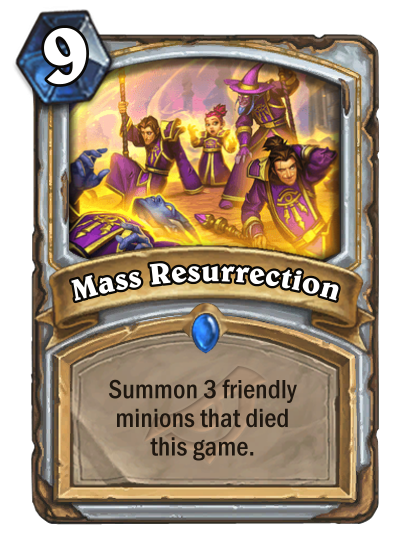 I would like to know if there is any difference between "Resurrect 3 different friendly minions" and "Summon 3 different friendly minions"? Is it just wording inconsistency ? This card for me is really hard to evaluate. Wall priest Was fine with resurrecting minions and healing face. You really want to buff them and kill opponent the turn after resurrection. Still wall priest is loosing so much that I'm not sure if it will be viable. No more Eternal Servitude, Psychic Scream, Master Oakheart, Shadow Visions Witchwood Grizzly, those are huge losses that cant be replaced by one resurrect card. If it comes to Gallery priest without Radiant Elemental, Eternal Servitude, Shadow Visions, Lyra the Sunshard, Shadow Essence this deck cant really otk. Am I missing something or spellstone is just better than this card ? Before: 4 for 7 maná. Now: 3 for 9 maná. Still, it is a worse replacement for spellstone, so I hope we are fine. “Maybe there's only a dark road ahead. But you still have to believe and keep going. Believe that the stars will light your path, even a little bit." Recycling is strong in this expansion. At 8 Jeppeto and 9 Mass Res!!! Excellent. Wow are they really running out of ideas? Let's look at the bright side of it: Wild Big Priest is not improved by this BS. Childish, unfitting artwork, overcosted, boring and already seen effect for less mana. Top tier garbage.